We have been serving the South Eastern Pennsylvania area since 2002. In our continuing efforts to better meet the needs of our customers, we have expanded from Import Cars of West Chester to PA Auto Select. We are located at 320 Boot Rd in Downingtown PA, just minutes off the RT 30 bypass. Owner, Michael Homaijani, has built his reputation in the community by offering a wide range of cars, trucks and SUVs in all price ranges to fit anyone’s budget. Our new dealership is a state of the art facility that offers a large indoor showroom where you can browse our inventory. Regardless of the weather conditions, you and the vehicles stay clean, warm and dry. The Service Department has all new up to date equipment for all makes and models. We can handle anything from routine maintenance to PA state inspections and most repairs. Our sales staff is made up of automotive veterans. We have learned that customer service is most important and we want to prove that every day. We are available Monday through Thursday from 9am to 7pm. Fridays from 9am to 6pm. Saturdays from 9am to 5pm. We are closed on Sunday. Appointments not required but, they are recommended. Our Service Department is open Monday thru Friday 8:00am to 6:00pm PA Auto Select’s mission, as it always has been, is to provide excellent customer service in all areas of your automotive needs. "Recently bought a 2014 BMW 640i gran coupe"
Great group of guys! After a small disagreement, they remained professional and followed through on a promise provided by the owner. Very impressed with how it was handled. Seem to be genuinely good people. No suprise fees. My salesman called weeks after to see how everything was going. Felt good doing business with them. I'll probably buy another car from them in the future. No issues with my car but be smart and get a warranty. After looking for a vehicle for almost three months I was fortunate enough to narrow my search to PA Auto Select on Friday December 7, 2018. I was grateful to work with Paul Lukens who demonstrated expert knowledge of the SUV I drove and was down to earth, professional and kind. I will definitely return and work with Paul and I highly recommend Paul and PA Auto Select. "No sales pressure but good results"
Saw the car online. Looked like a good deal. Read some not so great reviews about this dealership but liked the price point for the vehicle year and low mileage so gave them a shot. Tremendously pleased with the car, the experience, and the staff. Josh sold us the car and Ryan, the manager, filled in when Josh was closing another sale. Very informative and considerate gentlemen. I was pre-approved which made the process smoother. Also received great value for my low mileage trade in. Plan to return for my next purchase. 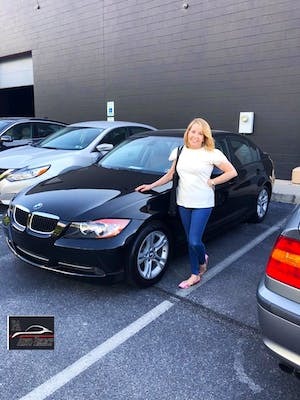 "My Second Car from Pa Auto Select"
This is the second car purchased from Pa Auto Select! I immediately checked their website to see what they had. Their cars are always clean and in great shape. I found a couple right away. I took the car that I ended up purchasing for a drive and I fell in love instantly. I enjoyed working with Josh and Ryan. The financial part was done efficiently. I highly recommend Pa Auto Select for a beautiful car and trustworthy sales people! PA Auto Select is the type of dealership that makes you feel more like an old friend than a customer. Chris worked with me and the length of time it took to bring the loan together. After lots of struggles through the loan company they held the car for me no problem. Was never pressured and was treated with the utmost respect even only being 19. My first dealership car buying experience went well because of the help from the team at PA Auto Select. 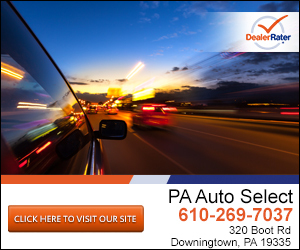 I highly recommend anyone looking for a car to trust PA Auto Select with their business. 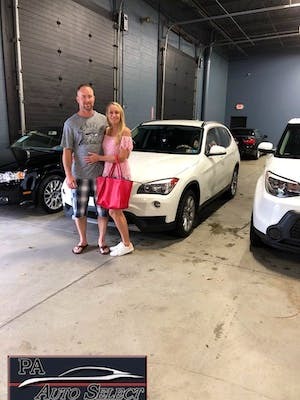 I purchased a 2005 Lexus RX330 from this place December 2015 because I needed a reliable car to get to work. This car had extremely low miles and rode very smoothly when I test drove it. I finalized the purchase the day after Christmas and was in and out within 2 hours. When I went to Conocelli a few months before I was 8 months pregnant and they left me in an office for 6 hours just to tell me the car I wanted could not be located even though I called ahead of time and was assured it was available. Having such extremely opposite customer service experiences, I was astonished on how attentive Paulo and Chris were to my needs and how they made me feel so comfortable buying my first car for my growing family. I was so impressed that I came back December 2016 to buy a 2012 Lexus RX350 again with unbelievably low mileage. The transaction went smoothy and I became an owner less than 2 hours later of my initial test drive. Ryan paid close attention to detail and explained everything thoroughly. I had secured an auto loan with my credit union before I got there so I was able to drive the car home that day. Every time I go there, I feel like a cousin reuniting at a family reunion. Lol These guys have my complete trust for being honest and open and for that I will always refer my family and friends to PA Auto Select. "Sold me a car that needed more work than I paid for it!" I purchased a 2008 BMW for $9990 and was assured all was good and they tested the vehicle. I was aware that it needed a mirror but that’s it. I drove the car home about 100 miles and then the next day noticed the engine light came on out of nowhere. I took it to a local BMW shop to see what it was and came out with a $9800 quote. The turbos were shot and I was recommend not to drive the car with it like that. It also had a valve cover leak that needed repaired. I contacted PA Auto Select and they told me I bought it “As Is”. I told them I understand but I just paid for a $9990 car that I cannot drive now. I feel like I was ripped off and they lied to me. Ryan assured me that they check every car over and put on the computer. If this was the case then either they knew the car had blown turbos or he lied and never checked it out. So after many calls to them they agreed to look at the car and I pay half of the bill to fix it. I told them no that at most I would pay another $2000 toward the turbos and mirror just so I could drive it. They refused and the owner Michael Homaijani walked away saying I bought it “As Is”. I requested then I just return the car and close the loan and we both go our own ways and they refused that as well and he just walked inside leaving me standing there. PA Auto Select is clearly not an honest company and I would not recommend them to anyone. I now have a BMW sitting in my driveway that I have not even made my first payment on and I can’t drive it. There should be a law that stops people like this from selling a car that you cannot drive and clearly they did something to it so it would last long enough for me to get it home. "Very bad car buying experience."